A recent email prompted me to revisit the topic of Superman. Although I’ve always favored Batman over Superman (feeling that Batman’s human origins make his personae more relate-able), but Superman has an interesting back-story. 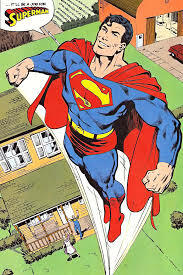 Superman was created by two Jewish men in Cleveland, Ohio, in the 1930s. Jerry Siegel and Joe Shuster created Superman as an amalgamation of Biblical heros like Moses and Samson with American ideals of the period. Superman represents a lot of bottled up angst within the Ashkenazic male psyche. Siegel’s father, a shop owner in Cleveland, was gunned down during a robbery. As a result, Siegel created a bulletproof superhero. Many of the characteristics of Superman are inversions of traditional Ashkenazic stereotypes. While Clark Kent is a bookish and awkward reporter, within him flourishes the awesome power to right all the wrongs of the world. Clark Kent fumbles around his lady love, but Superman is expressive and Louis Lane cannot help but be won over. Yet despite the very obvious physical similarities between Clark Kent and Superman, when he is Clark, no one can see the latent Superman underneath. After the abortive Bar Kockba revolt of 132-135, Jews were dispersed from the area that is now Israel and began to laud study and prayer over military or agricultural activities (even though the Tanakh is based in an agricultural society). Jews reinterpreted our role and made the scholar into the hero. In the Talmud, the highwayman Shimon ben Lakish (Reish Lakish) is a strapping and muscular criminal who turns into a gentle study partner for the dashing Rabbi Yochanan. Shimon ben Lakish represents a removal from the psychical world, an inverse of Superman. This trend would be best summed up from a line in the Hadran ceremony, the ritual for completing a course of study of Mishnah or Talmud. We work and they (non-Jews) work. Their (non-Jewish) work is empty and pointless, our work (ie study) brings us merit in the World-to-Come. 19th and early 20th century Eastern European Jews also struggled with a desire to release their sensual and physical potential. The poet Shaul Tchernichovsky famously wrote an ode to the goddess Astarte (one of the forbidden deities in the bible). It is a good example of the Zionist and early Israeli desire to return to the Tanakh and eschew the Talmud and Rabbinic Tradition. The feeling was that the Rabbinic Tradition (along with diaspora languages such as Yiddish) had been emblematic of powerlessness. The poem below expresses a yearning to break away from the quiet yeshiva student and return to the eroticism and power of the heroes of the Tanakh. In a son of Canaan’s hands, from Sidon, stronghold on the sea? Did Dan’s chieftains lie in wait for him at night along the trail? Led forth by tinkling bells and singing moons1 across the land? You’re wholly made of ivory, limbs perfectly united. But the secret no man will reveal — who brought you here to me? And with dawn lead me unto my toil. And like tefillin-straps the palm-paved highways all glide down. Of the roads of Israel. Which are we as a people? Are we muscular and tan? Are we pale but intelligent with good sense of humor? Which are we, Clark Kent or Superman, or both?